When powering up the MicroScribe 3D digitizer (CMM), the "Home" position (or start up position) is critical because it is used by the MicroScribe as a reference for calculating and establishing an origin (0X, 0Y, 0Z) and reference coordinates in the 3D workspace. - The stylus is perpendicular to the surface on which the MicroScribe rests. - The stylus tip is completely and firmly seated in the stylus holder. - The counterweight is pressed firmly up against the bottom of the stylus holder. Each time it is powered up, the MicroScribe performs a sort of "self-calibration". The "Home" position is the one position that can be consistently repeated (base joint position aside); therefore it gives the MicroScribe a reference point against which all other points can be measured. 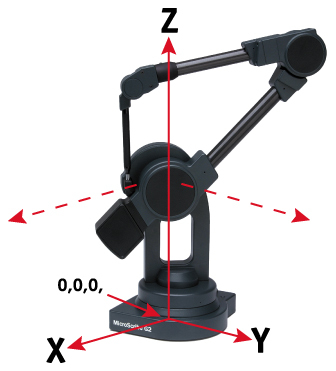 In other words, if the MicroScribe is in the "Home" position when powered up, then it can calculate stylus tip position based on known (arm) segment lengths and these specific, known joint angles. Once the stylus position is determined at startup, it can be continuously recalculated based on changes in the joint angles. So the key to everything is the starting position and its known joint angles. The MicroScribe is dependent on you, the user to establish good reference data... give it bad reference data (power it up in a position other than the "Home" position), and inaccurate and unpredictable data will result. The vast majority of support calls relating to MicroScribe inaccuracies are due to this simple, common mistake. NOTE: on G2L, G2LX, 3DL, and G2LX models, it is possible to place the stylus in its holder with the wrist roll joint 180 degrees out of proper alignment- this will result in the stylus being at a slightly non-perpendicular angle relative to the desktop. To correct this, remove the stylus from its holder, spin it 180 degrees and place it back in the stylus holder. At power-up, the default origin (0,0,0 point) is set directly below the center of the base joint axis, flush with the bottom of the base plate. This also corresponds to the center of the threaded insert used for tripod-mounting the MicroScribe. Is the stylus holder clean/free of lint, debris, etc.? Is the stylus tip screwed in firmly and completely? Did you power up the MicroScribe up with a nonstandard or custom stylus tip? Is the counterweight resting firmly against the bottom of the stylus holder? Is there any foreign substance (modeling clay, etc.) stuck to the bottom of the stylus holder or to the stylus tip? GHOST 3D, LLC (home): GHOST 3D provides 3D digitizers, scanners, complete systems, and software based 3D modeling and reverse engineering solutions.